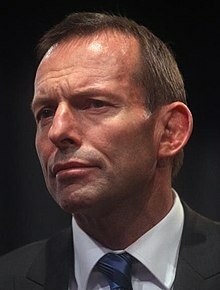 Tony Abbott (janam: 4 November 1957) Australia ke purba Pradhan Mantri hae. ↑ "Senators and Members: The Hon Tony Abbott MP". Parliament of Australia. Commonwealth of Australia. Retrieved 14 June 2014. Ii panna ke 25 October 2015, ke 16:50 baje, pichhla time badla gais rahaa.